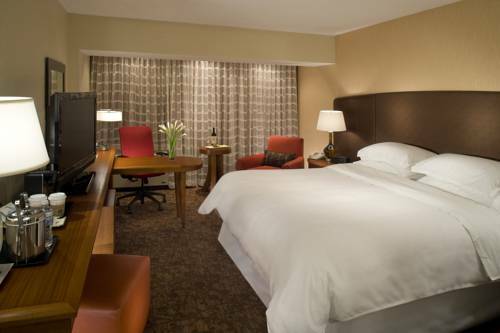 The only full-service hotel on the University of Iowa campus, the Sheraton Iowa City Hotel is conveniently located in the heart of Iowa City. Step through our doors onto downtown Iowa Citys historic pedestrian mall to enjoy its many offerings. Our hotel is surrounded by great sidewalk cafes, unique shopping, gourmet dining, and amazing seasonal entertainment, such as the Summer of the Arts Friday Night Concert Series, the Iowa City Jazz Festival, and the Iowa Arts Festival. If you are visiting the University of Iowa, the Hancher Performing Arts Center, Museum of Art, Carver Hawkeye Arena, and the legendary Kinnick Stadium are just steps away.Our 234 guest rooms, all 100% smoke-free, are the perfect choice for business and leisure travelers. All feature the Sheraton Signature Sleep Experience with crisp white bedding, 37-inch flat screen televisions, Shine for Sheraton bath amenities, and complimentary Starbucks coffee.Tune into wellness at Sheraton Fitness and our heated indoor pool.Computer workstations, located in the lobby, make it easy to stay productive while traveling. Then enjoy a bite at Share Wine Lounge & Small Plate Bistro, our contemporary restaurant.With over 11,000 square feet of event space for meetings, conferences, and reunions, our banquet and convention staff can help plan and create an event thats truly memorable. So whether you are visiting for pleasure, looking for a venue to host a conference, planning a reunion with your fellow Hawkeyes, or seeking the ideal place for an Iowa City wedding, we invite you to enjoy the Sheraton Iowa City Hotel. Share Wine Lounge & Small Plate Bistro: Share Wine Lounge & Small Plate Bistro features an extensive wine menu while encouraging the guest to share, sample and explore a variety of cuisines. Our food is prepared using sensible and fresh ingredients that are sure to fulfill. A largely undiscovered gem of a town, Iowa City is home to countless activities and attractions, and the Sheraton Iowa City puts you in the heart of the action. Our downtown convenient location on Iowa City's historic pedestrian mall puts you within strolling distance of many shops, restaurants, and other attractions.With two golf courses within a five-mile radius, and the Iowa River just a short walk away, opportunities for outdoor activities are abound. Sports fans can also support the University of Iowa's teams on their home turf at the nearby Kinnick Stadium and Carver Hawkeye arena.A thriving area for the arts, Iowa City boasts venues like the Hatcher Performing Arts Center, the Riverside Theatre, the Angler Civic Theatre, and the University of Iowa's Museum of Art. Should you wish to venture further, simply hop aboard our complimentary shuttle transportation within the Iowa City/Coralville area.Downtown Iowa City also hosts a variety of festivals and events, including the University of Iowa's Riverfest in the spring, the Iowa Arts Festival in June, and the Iowa City Jazz Festival in July. Weekly events include Friday Night concerts on the pedestrian mall, and the farmers market, open Wednesday and Saturday, May through October.